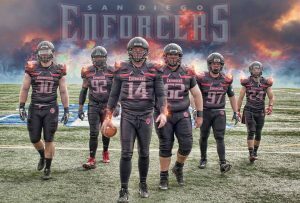 Please join us for the annual “Salute to Service” game where the San Diego Enforcers will honor our veterans at half-time. All veterans, guardians and supporters are welcome to attend and proceeds from this game support Honor Flight San Diego. The game will be held at Kearny Senior High School, 1954 Komet Way, San Diego. Kick-off is at 3 p.m., it is a family-friendly event and tickets are just $10 at the gate.